• The original clean-face. We created the fireplace that created the clean-face category, with no louvers or other clutter. 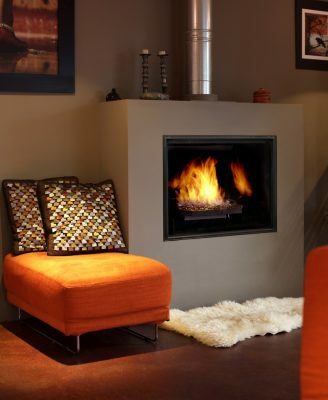 • The most flexible venting options available, to allow every fireplace to go in the perfect spot in any space. • The only fireplace with All Season Comfort™ – purpose-designed to offer comfortable heat without overheating a room..
• Design-A-Fire customizable options: including 10 different models, 9 choices of fire burners / logs & 8 firebox panel styles. • A safe, unobstructed ceramic glass face which will not crack or break under high internal temperatures. • Handcrafted quality, heavy-duty full-seam welded construction & premium materials up to 76% heavier than other fireplaces. A classic barrel arch face recreates the authentic look of a Rumford-style hearth found in fine period homes.